Tour Italy from your table with a wave of Italian small plates at Lago by Julian Serrano. 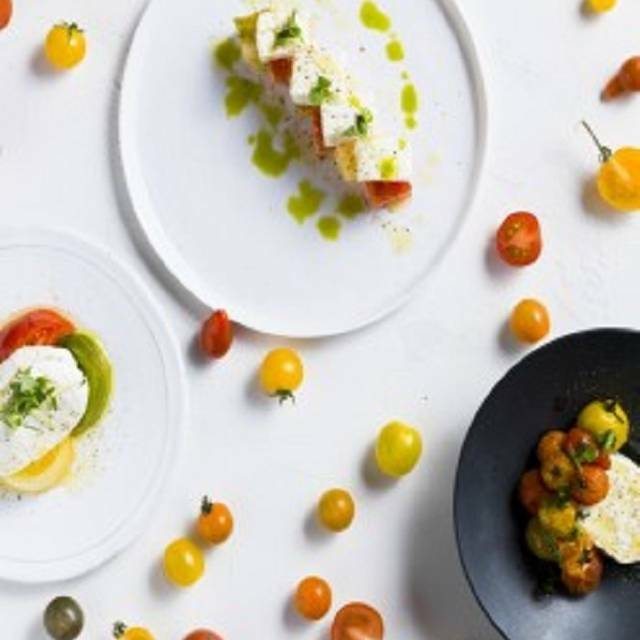 James Beard Award-winning chef Julian Serrano sets the evening in motion with his stunning interpretation of innovative Italian small plates, each packed with distinct flavors from all the regions of Italy . 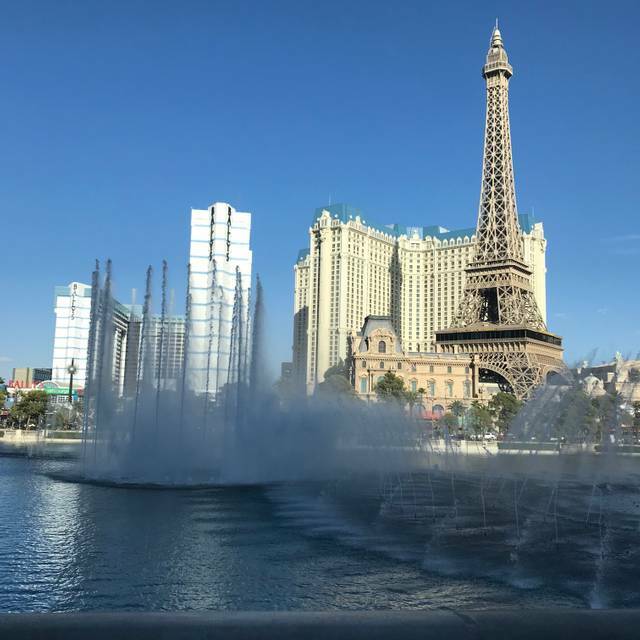 Encompassing 6,650 square feet of prime Las Vegas real estate overlooking the legendary Fountains of Bellagio, Lago by Julian Serrano will bring a truly cutting-edge dining experience to Bellagio and Las Vegas. Lago’s design takes its cues from Italian Futurism,rejecting the past to focus on forward-thinking dynamism and experimentation. 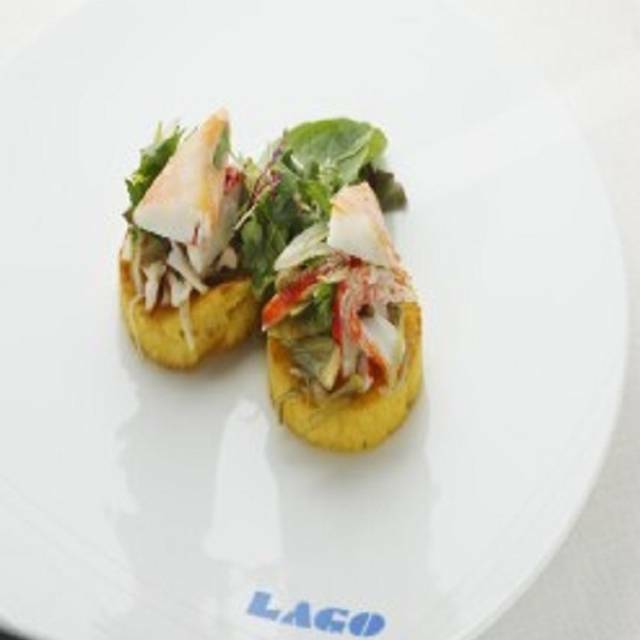 See, taste, and socialize at Lago. The food was exceptional! We have traveled around the world and had really good food and Lago’s is one of the best we’ve had so far. Service was great and we had a killer view from our table. Cocktail selection was great too. 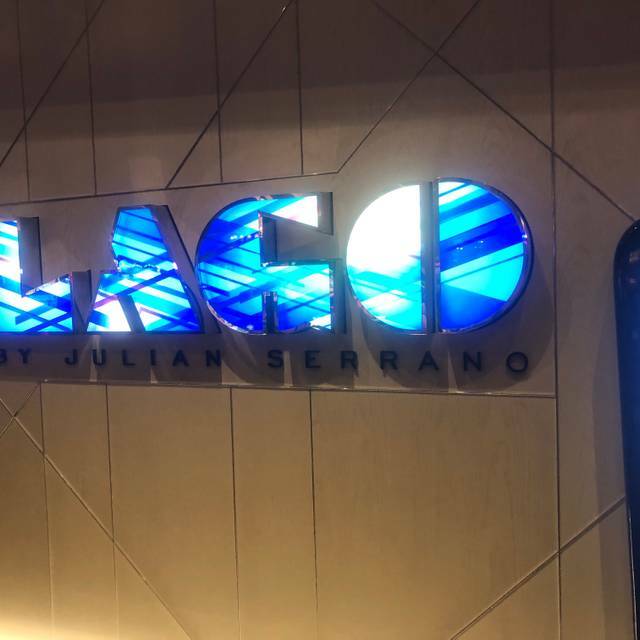 Because of our nice experience at Lago, we went to Julian Serrano Tapas for lunch the next day. The food there was exceptional as well, full of flavor, very well prepared. We loved the Pintxos in Spain and the food at JS Tapas can rival those. Prices at both places are a bit pricey but it’s worth it! We will definitely eat at these two restaurants again when we come back to Vegas. Overpriced considering it was lunch. The bread basket has been completely eliminated. Thank you. Lovely setting and excellent food. Our experience was only marred by a family which let their children screech and bounce on the seats. Perhaps a cut off time for patrons with young children, say 8:00 pm, is in order. Perfect restaurant for that special night! The service and food was perfect. Way overpriced even for perfect. We had flatbread salad and pasta and two glasses of wine for $200? We LOVED Lago for our dinner. Wonderful and scrumptious Italian small plates paired with excellent and affordable wine. We were on the patio with clear view of the Bellagio fountains. A fantastic experience! The restaurant was extremely noisy. Both the house music and people were very loud. The tables were so close together, the wait staff kept bumping our chairs. We got up and left before ordering. I’m sure the food would have been fine. It appeared that everybody is made to wait regardless of reservation time and the fact that many tables were available. Upon arrival we were not welcomed at all and were literally told to sit on the couch and wait. We were seated about 7:40 for a 7:00 reservation. The table we were seated at seemed to be an afterthought shoved into an odd space with waiters walking by constantly. We noticed that there were two nice tables for four on the patio, so we asked if we could be seated at one of those. We were told no as they were on a “casino hold.” They remained empty during our whole dinner. The waiter was nice enough though nothing special. The food and drinks were extremely overpriced for the quality and quantity. It is touted as tapas style with each small plate costing $20 - $30. And the small plates are tiny. You can go to a much more “expensive” restaurant, get better food and still end up with a much smaller bill. I would not return or recommend. There are many better places in Vegas. Wonderful service! Fantastic food! Our waiter Fabio was attentive and knowledgeable! 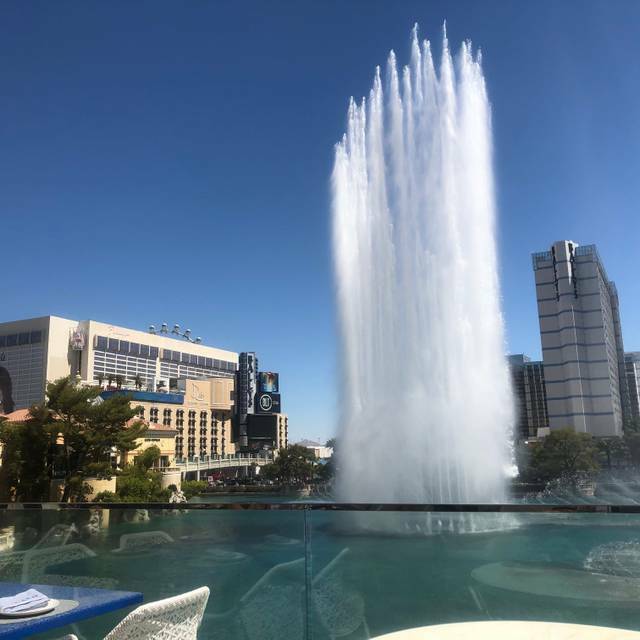 Requested and obtained an outdoor table with wonderful fountain shows throughout our meal! Can not wait to go back! Excellent in every category with the exception of the noise level. Having said that, much of the noise was due to the fact that guests were absolutely enjoying themselves. Will definitely make this a regular dining option on future visits to Las Vegas! Our waitress couldn’t have been more friendly and made excellent recommendations for helping our party choose what to eat. The food/presentation was excellent, and we will be back. Thanks for a memorable evening. I booked early and received a water front view. My customers loved it! This was my 2nd year to eat there and will be back. Beautiful setting with great food. Great view and the food is really interesting and tasty. Good for familynor for business. Casual but very nice environment - can dress up too - all goes. Menu was a bit hard to figure out For overseas guests so we just had the waiter bring what he wanted - much more enjoyable for us all. We were able to sit on the balcony and what a wonderful evening. Dinner took us approximately 2 hours which was perfect with the viewing of the fountain shows. The small plates were perfect to share amongst the four of us The specialty drinks were phenomenal with ice that had flowers in it. We will be back. Food was great! Loved the ambiance and could take as long as you want to eat. We didn't feel rushed. Husband and I loved grabbing a bite to eat before going to see "O" while at the Bellagio. There is an option to pick your portions - either between tapas or large plate. Fantastic ambiance in the restaurant, as well as outside with the fountains! Food was pricey, but delicious. We were lucky to be seated on the patio without having to wait for it. We were at the very back, but I’m not complaining! Seeing the fountain show from the patio was fun. The food was great. 7&7 was phenomenal—I wish it was a bigger portion for the price. The duck was great, and we also enjoyed the wine and burrata risotto. The cannelloni was “meh”...good enough, but nothing special, in our opinion. Pesto linguine was solid, and we liked the bass. I can’t remember the name of the dessert, but it was chocolate and cappuccino. We liked it. Service was really good. I’ve seen other reviews say that servers were pushy or pushing the most expensive meals...this was not our experience. Very easy-going waiter, and totally willing to let us take our time ordering a few tapas at a time. The staff that brought the food to our table were also very friendly. It was a pricey meal for tapas, but the food was great and we loved the experience. Service was excellent and we sat with a perfect view of the fountains. The food was “meh”; sauces were bland and uninspired (we ordered piccata and puttanesca, which should have been robust). For some reason, the chef didn’t want to serve a side of pasta... in an Italian restaurant this just seems weird... Great ambiance, but there are much better places to eat for this $$ price point. When the fountains are on, the music should be played louder in the restaurant so we can hear it. Food was mediocre at best. Not worth the money. Where do I begin? 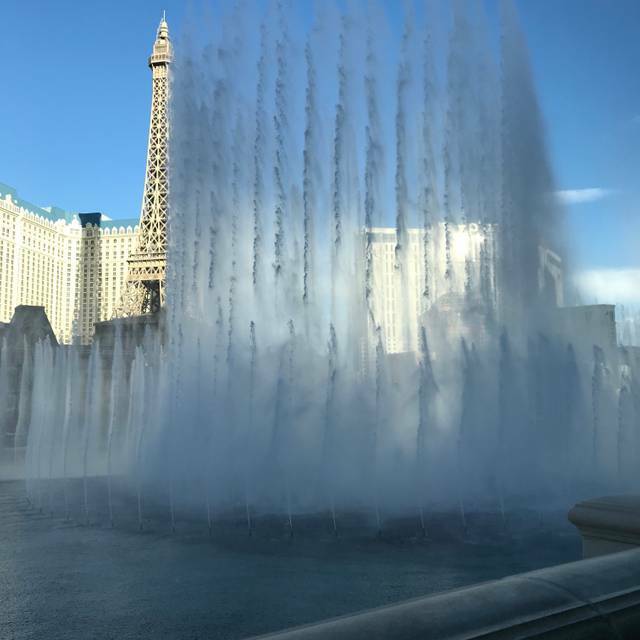 The outdoor dining overlooking the fountains of the Bellagio was absolutely amazing. Service was impeccable. Specialty cocktails were really unique and incredibly tasty. The small plate idea is awesome and lets you try a little bit of everything. If you are looking for an outstanding upscale restaurant in Vegas, you’ve found it. We will be back for sure. Everything was great! 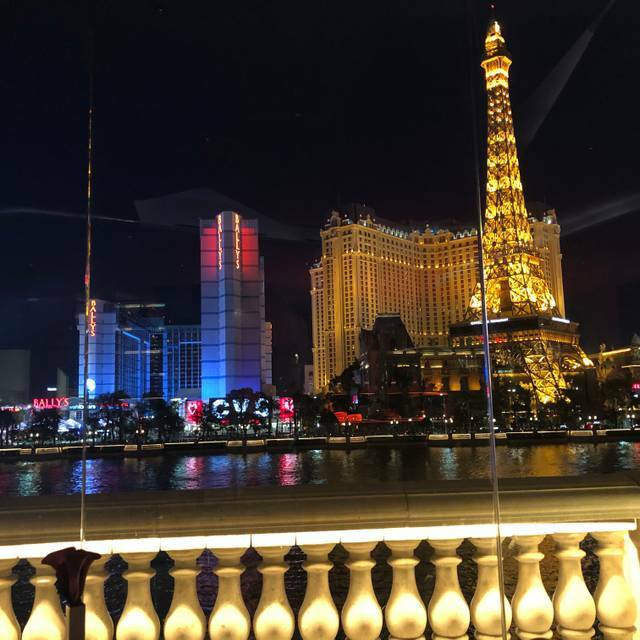 Food, service, view! We had a best table with fountains view . Amazing meal, eat on the patio if you can for a fountain show every 15 minutes! Excellent cheese platter. I recommend the linguine al pesto. Delicious. The fountain show was a.azing and we were lucky to get a table at the patio. Get there early, it is so worth it. The food was much more expensive than it should have been. Everything tasted great but portions were incredibly small - even the meat options. The server was friendly and all, but seemed a little pushy to get us to order right away. Our waiter could not be bothered to find out if what I wanted to eat off the menu was gluten free. He didn’t want to ask the chef. I have been here before and they were incredibly accommodating so I’m not sure what happened. Food, view and overall experience was amazing! Excellent Sunday Brunch! Superb selection, elegant/fun atmosphere, good drinks and value! Highly recommend. We had the duck polenta, lobster benedict and french toast for starters - all excellent. Second course, we had steak & eggs, lasagna, frittata and avocado toast - again, excellent! BONUS - $28 for unlimited mimosas, bellinis and bloody marys! Must go here at some point in your Vegas trip. 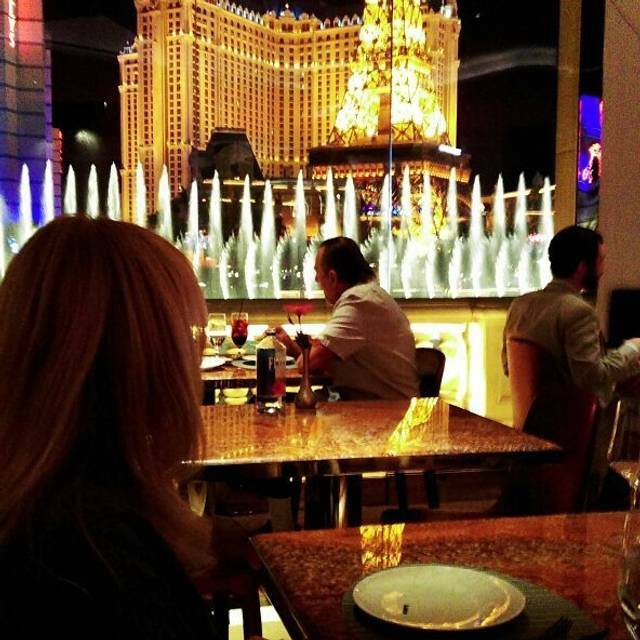 You can’t beat dining while having front row seats of the Bellagio fountain. The food was delicious. The food was outrageously overpriced. The Spaghetti Popette tasted liked canned Chef Boyardee. The waiter was rushed and impersonal. The fountain view, not really. We could see the top of the water spraying if you call that a view. It was a terrible experience overall. I do not recommend it. 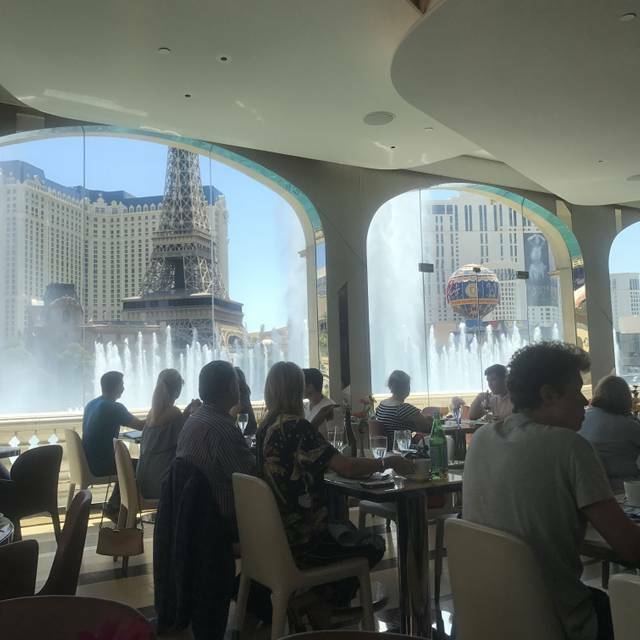 LAGO offers great view of the Bellagio fountain from the hotel side, especially if you are seated at the window. .
Now the food - What I didn’t know was that it is a Tappa restaurant. Each Tappa plate is about $20, and the server recommended 3-4 per person. Entrees are $60+. the portions very small, taste ok, at least the ones I picked. Drinks are good, though pricy. Overall I certainly wasn’t WOW’ed. For what you end up shelling out at this restaurant, you can have a WOW meal else where (like the Costa Di Mare or at the Wynn).